Secluded St. Simons Island Deepwater Estate on Frederica River. The Landing at West Point with residence and guest house borders the historic Plantations of West Point and Pikes Bluff (c 1736). One level living in the brick over block main residence features great room with vaulted ceiling, masonry fireplace, bright spacious sunroom, updated kitchen with butler's pantry and breakfast room. Master suite with bath, three guest rooms, two more full baths and two half baths. It has a warm paneled study plus a large family room both with masonry fireplaces. Thereâ€™s even a workshop. The comfortable two bedroom guest house with great room, kitchen, bath, and porch provides more room for houseguests or caretaker. Fish for Reds, Flounder, Trout, Crabs and Shrimp from the dock with sundeck and boat house. Floating dock and mooring space for several good sized boats. Ancient moss draped oaks cloister the 3+ acre parcel. 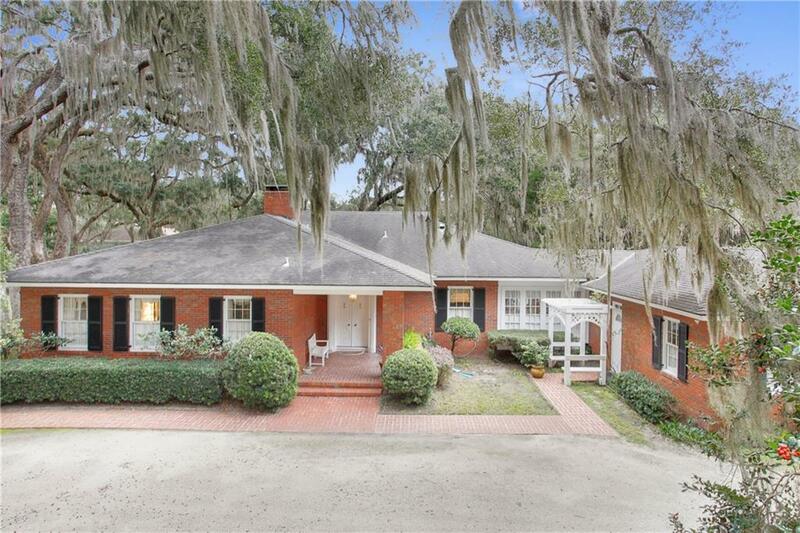 A rare opportunity on St. Simons Island - a Happy Isle on Georgia's Coast.